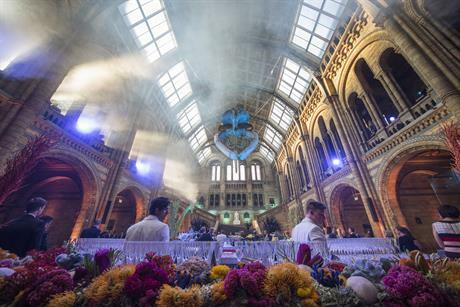 The Natural History Museum has re-opened its Hintze Hall event space following an industry event to showcase the transformation. 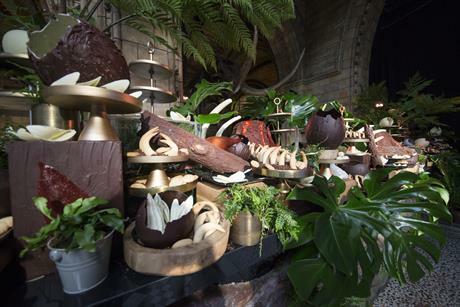 The Natural History Museum reveals a new-look Hintze Hall which features a stunning 25.2 metre blue whale skeleton suspended from the ceiling, with the opportunity for guests to dine directly underneath. The launch event invited 1,100 guests including industry leaders to celebrate the re-opening of Hintze Hall. Guests were treated to an immersive experience on arrival including an ocean-inspired star cloth draping a walk-through tunnel, with smells and sounds of the sea. The guest journey continued through a mist curtain into Hintze Hall, immediately experiencing the grandeur of the new blue whale skeleton, under which was a seascape with caterers Rhubarb providing cocktails and food. The Giraffe’s Playground area offered vegetarian delights whilst the Dinosaurs Dessert Station included an edible volcano. The Museum’s scientists were on hand to answer guests’ questions and encourage them to engage with the new collections in the Wonder Bays. Speeches were delivered by the Museum’s chair, director and special guests including Sir David Attenborough. The evening was punctuated by a specially commissioned musical piece performed by a 14-piece orchestra from the London Contemporary Orchestra, a solo performed by Sir Thomas Allen and culminated with a light show created by White Light. Hintze Hall, suitable for dinners, awards ceremonies, product launches and private corporate events, has a capacity of 600 dinner guests or 1200 for a drinks reception. The overall capacity is boosted to 3000 guests when the whole museum is booked for exclusive use with Hintze Hall as the central venue. The museum also has a wealth of smaller spaces for hire such as Fossil Way and Dinosaur Way, or Earth Hall, home to the world’s most complete Stegosaurus skeleton. Earth Hall holds up to 400 guests for a drinks reception with space for 200 guests to dine beneath the Earth sculpture.